Eureka! 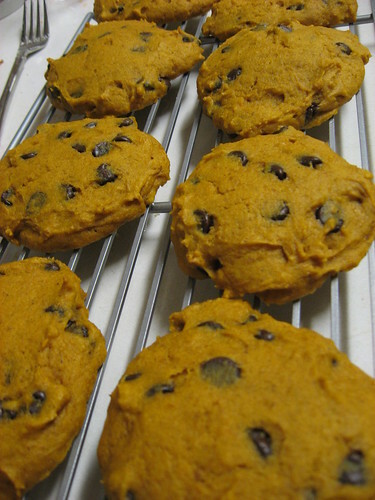 Joy the Baker has blessed us with the most marvelous Pumpkin Cookie recipe that I’ve tried. This recipe dances circles around the one I tried last week. Part of the key is flattening and smoothing the dough with a thin metal spatula before baking. At first I thought this step seemed a little odd to me, but having a flatter cookie (still very soft and cake-like) came out so much tastier than the poofy, muffin-like variety. Also this recipe called for more of your typical pumpkin pie spices such as nutmeg and cloves. It tastes exactly the way delicious pumpkin desserts were meant to! If you like a caramel taste to your pumpkin cookies, then butterscotch chips would be great. I knew from my previous pumpkin cookie attempt that I wanted more chocolate (who doesn’t?). Instead of just 1 cup of chocolate chips, I added an extra 1/2 cup and used bittersweet chocolate chips. I also used a whole can of pumpkin instead of a half can. Preheat your oven to 325 degrees. Prepare two baking sheets with buttered parchment paper. Combine flour, baking powder, baking soda, salt, cinnamon, nutmeg and cloves in a medium bowl. Set aside. In a large bowl (or stand mixer), lightly beat eggs and sugar until smooth (about 1 minute). On low, add the oil, pumpkin, and vanilla until blended. Remove bowl from stand mixer and fold in the flour mixture until fully incorporated. Stir in chips. Using an ice cream scoop or 1/4 measuring cup, scoop dough onto baking sheets, spacing 2 inches apart. Don’t forget to use a thin metal spatula to smooth and flatten the dough! Bake cookies one sheet at a time for about 16 minutes – the top should feel a little firm and a toothpick or fork inserted in the center will come out dry. Let the cookies sit for about 5 minutes before removing to a wire rack. 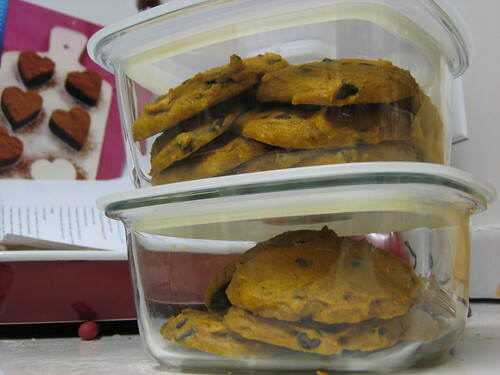 Cool the cookies completely before storing in an air tight container. Try not to eat them all in one sitting! Makes about 2 dozen cookies. Whoa, those look good. Great site so far, looking forward to seeing more! Sorry about that – I always use the 15 oz. can unless otherwise stated.